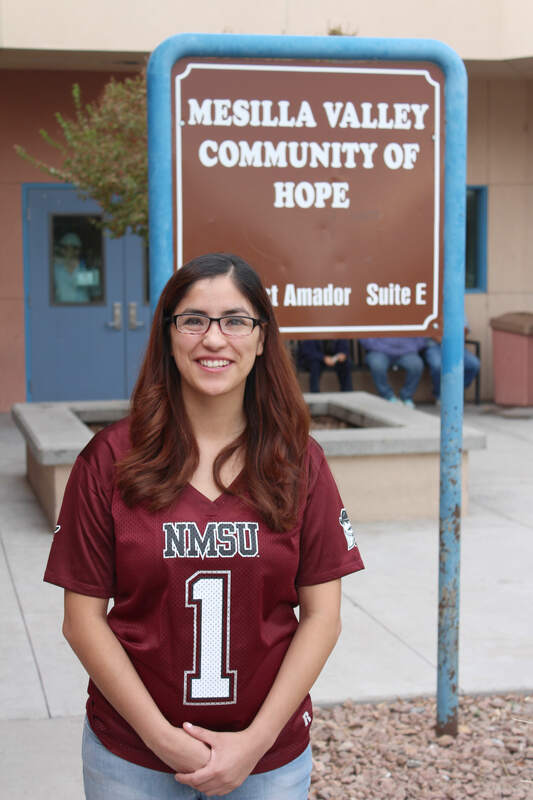 Bernadette, like most NMSU students, is working toward something larger than herself. As a social work major, she sees the people and environment around her as a breathing organism. It needs to be fed with support and patience and cared for on a daily basis. To that extent, Bernadette volunteers 16 hours a week at Mesilla Valley Community of Hope – a service center that addresses homelessness and poverty in Las Cruces and Doña Ana County, New Mexico. “I chose social work because I fell in love with the concept of learning why people do what they do and how a particular environment will impact those actions,” she said. In addition to Bernadette’s volunteer schedule, she maintains a part-time position to help pay for college. When budgeting for tuition, books and supplies, she oftentimes is unsure how to make ends meet. To come to the aid of students like Bernadette, the College of Health and Social Services has created the HSS Volunteer Scholarship. Designed to offset costs related to tuition, books and expenses, the HSS Volunteer Scholarship helps hard-working students in Nursing, Social Work and Public Health – with a GPA of 3.0 or higher, who are actively volunteering in their community – focus on studies, rather than worry about how to pay for their education. We know that volunteerism is a tangible way for our majors to put into practice the knowledge they are learning in our classrooms. It positively impacts their lives and it makes an enormous difference in our communities. Your gift of $10 empowers students who volunteer locally in their community. Your gift of $25 empowers students who volunteer locally in their community. Your gift of $50 empowers students who volunteer locally in their community. Your gift of $100 empowers students who volunteer locally in their community. Your gift of $250 empowers students who volunteer locally in their community. Your gift of $500 empowers students who volunteer locally in their community.